When you say prom, we girls all think of that perfect dress don't we? One of the best things about prom dresses is there's so many styles, so many colours, and dresses to suit every single budget on the planet. I've spent the last few months brainstorming some dress ideas on the beauty that is pinterest, to give me lots of ideas on styles and colours, so I'm a little bit more prepared when I finally get to go dress shopping, although I know I'll be like a little kid in a sweet shop when I get there. Today I thought I'd share with you three of the pinterest dresses I've fallen in love with. I already know I'd like a long fairly fitted, dress in a neutral or pastel shade, so I've condensed my search to dresses that match this description. Up first we have this neutral sparkly Sherri Hill beauty of a dress. Sherri Hill has to be one of my favourite dress designers, the only downside being most of their dresses are miles out of my budget. I love how well the sparkly bodice of this dress contrasts with the simplicity of the A line skirt; it works so well. It's got a bit of a vintage esque to it and I also love how this dress has a different neckline to your typical prom dresses. It'll definitely make your dress stand out from the other girls, that little bit more. Normally I wouldn't be one for a dress that's full of sparkle but I do love this dress, and it'll definitely be a style of dress I think I'll be keeping an eye out for when I'm off dress shopping. If you're interested in this dress, it's Sherri Hill design 21053 and you can pick it up in the uk for around £360. Dress number two is a stunning cream/light pink dress with a stunning sparkly one shoulder strap. I love the simplicity of this dress, and the sweetheart neckline is to die for. I'm not sure of the designer but I'm sure after a bit of online research you'll be able to find it out. It has a stunning floaty skirt that looks perfect for doing a bit of dancing in! Next we have a stunning Sherri Hill dress that I've fallen utterly in love with. It features an incredible collared neckline, which is made of a gorgeous lace. The bodice of this dress is very fitted and there's beautiful sparkly belt at the waistline, seperating the bodice from the pleated A line skirt. If I had the budget, I'd choose this dress in shade "Light Green" (as shown on the image) however you can pick this dress up in a range of different colours. I know I sound like I'm advitising this dress, based on the amount of adjectives I've used in this description but I just love it so much. I couldn't track this dress down on any UK Prom Dress websites but if you're still interested it's design 21334. 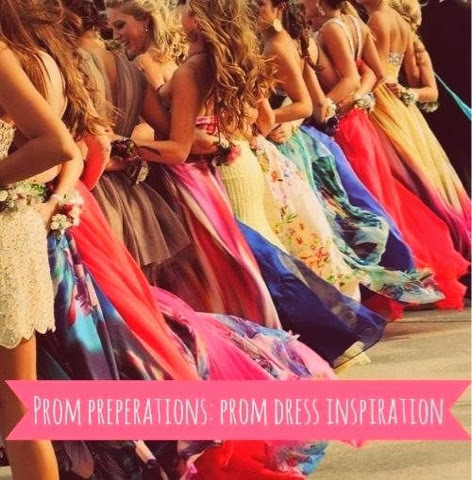 Have you been brainstorming ideas for prom dresses? What sort of style are you looking for? Prom Preperations What Do You Want To See?